Jeff Cox is a trial lawyer and a member in Dykema's Products, Class Actions, and Professional Liability Group. Jeff has served as lead counsel in cases from Montana to Florida and has spent most of his career defending manufacturers and retailers in product liability, mass tort, class action and patent litigation. Jeff’s clients include several Fortune 500 companies and several international manufacturers. The vast majority of Jeff’s product liability cases are high risk matters involving death or serious injury. Jeff has been one of only a handful of trial lawyers in the nation chosen to investigate, analyze and, if litigation ensues, defend one of the world's largest automakers when fires and explosions have occurred involving their products or facilities. 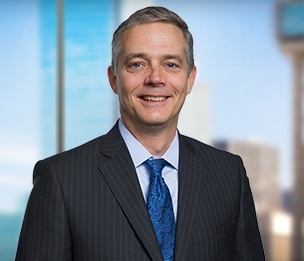 Throughout his career, Jeff has worked hand-in-hand with engineering experts to defend defect claims involving heavy trucks, passenger cars, heavy machinery, appliances and consumer electronics. In addition to his products liability docket, Jeff has defended his clients in many complex commercial cases ranging from contract disputes to the infringement of multiple patents. Jeff has first chair experience in class certification hearings and Markman hearings. Jeff has helped his clients obtain landmark rulings in the no-injury class action arena and was recently part of select team tasked with handling thousands of claims pending in multi-district litigation in New York. General Motors v. Iracheta, Sup. Ct. No. 02-0932. Appeal to the Texas Supreme Court following a multi-million dollar jury verdict for the grandmother of a young boy killed in a crash and subsequent fire. The trial which occurred in Laredo, Texas involved many antics including the grandmother standing up in closing argument without permission and speaking to the all Hispanic jury in Spanish. The verdict was ultimately reversed and rendered by the Texas Supreme Court based on inconsistencies found in the theories of Plaintiff’s experts of causation and product defect. Everett v. TK Taito et al. Ct. App. (Fort Worth) No. 2-04-181-CV. On the heels of many other successful actions in other states, these Plaintiffs had sued on behalf of a statewide putative class of vehicle owners in Texas with a specific brand of seatbelt buckle. Plaintiffs contended that the buckles that had been subject to a series of recalls. As they had in many other states, Plaintiffs alleged that the design of the buckles made them susceptible to partial unlatching and thus a severe risk of injury in a collision. Creatively arguing for the first time that the “propensity” to unlatch did not manifest in an “actual injury” and thus the Everett’s did not have standing to sue, the trial court granted summary judgment for the Defendants. The ruling was upheld on appeal. As a result of the decision, Mr. Cox was interviewed by the Forbes Radio Network.